Dutch Island, between Jamestown to the east and Saunderstown to the west, was known to the local Indians as Quetenis. The 81-acre island became known by its present name because the West India Company established a trading post there in the 1630s. They traded Dutch goods in exchange for furs, meat and fish from the Indians. 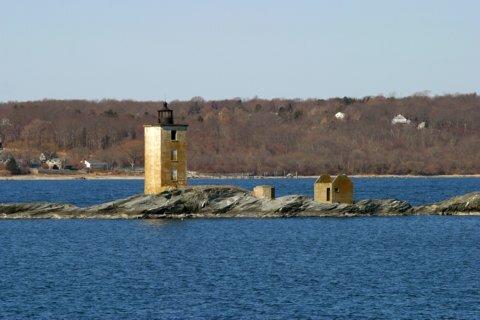 The federal government acquired six acres at the southern tip of the island in 1825, and a year later Dutch Island Light was established to mark the west passage of Narragansett Bay and to aid vessels entering Dutch Island Harbor. The first 30-foot tower was built of stones found on the island. A second 42-foot brick tower and keeper's house were constructed for $4,000 in 1857, with a fourth order Fresnel lens showing a fixed white light. The new square white tower was attached to the keeper's dwelling. A fog bell was installed on the side of the lighthouse in 1878. The bell's striker was operated by a clockwork mechanism inside the tower. In 1924 the light's characteristic was changed to occulting red. The lighthouse was automated in 1947, and the last keeper, Ernest Stacy, was removed. In 1948, after the military use of the island had ended, the entire island except for the .25 acres immediately surrounding the lighthouse was deeded to the State of Rhode Island. The deed stated that the island was to be used "for the conservation of wildlife." The Coast Guard proposed discontinuing the light in 1972, saying it had outlived its usefulness. They pointed out that in January of that year the light had been out for several days before anyone reported the problem to authorities. There was tremendous opposition to discontinuing the light. The island and lighthouse are now owned by the Rhode Island Department of Environmental Management (RIDEM). From Interstate 95 take Route 4 south to SR 138 east. As soon as you've crossed the bridge, take the first exit. Continue straight on the ramp (it becomes Tasshtassuc Rd) until you get to a T intersection with North Rd. Take a right onto North Rd. In about 2 miles you'll come to a set of lights. Take an easy right (as opposed to a 90 deg. right) onto Southwest Ave. In 0.6 miles you'll bear right onto Beavertail Rd. You'll also see signs for Fort Getty Recreation Area. Just a few hundred feet up you'll see a sign for Fort Getty Recreation Area and Ft. Getty Rd. Take a right onto Ft. Getty Rd. Go into the recreation area and head for the far side of the area. You'll see the lighthouse a short distance offshore.